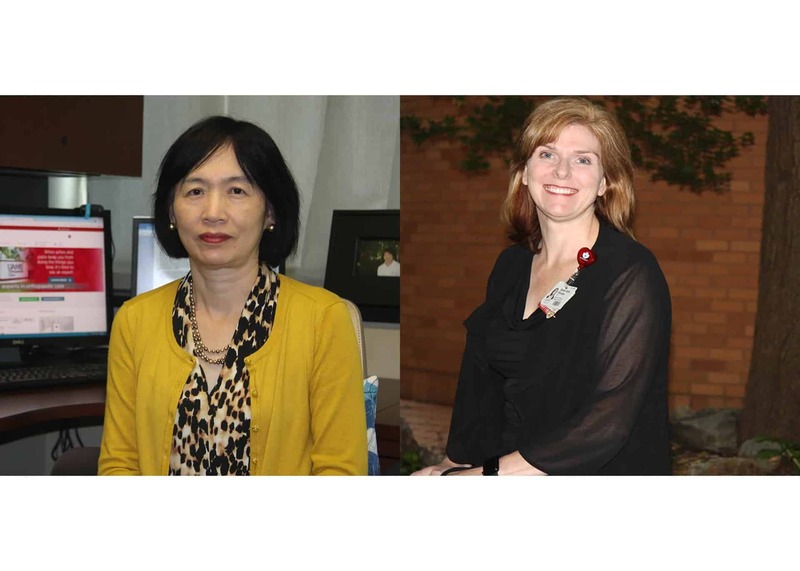 Pao-Feng Tsai, Ph.D., R.N., and Sarah Rhoads, Ph.D., A.P.R.N., were recently inducted as Fellows in the American Academy of Nursing. Oct. 10, 2017 | Oct. 10, 2017 | Pao-Feng Tsai, Ph.D., R.N., professor in the University of Arkansas for Medical Sciences (UAMS) College of Nursing and Sarah Rhoads, Ph.D., A.P.R.N., director of education in the UAMS Center for Distance Health, were inducted Oct. 7 as Fellows of the American Academy of Nursing. Tsai has been at UAMS since 1999, starting as an assistant professor in the College of Nursing. She became an associate professor in 2005 and a professor in 2013. She also served as an adjunct assistant professor for geriatrics from 2002-2005. Tsai holds the Alice An-Loh Sun Endowed Professorship in Geriatric Nursing. Prior to working at UAMS, she was a research assistant in the Institute on Gerontology and research associate in the College of Nursing at Wayne State University in Detroit. She was also a staff nurse at the Taipei Mackay Memorial Hospital, a Fellow of the Home Health Care Program at the Department of Health, and an instructor at Deh-Yu Nursing College, all in Taiwan. Tsai earned her Bachelor of Science in Nursing in 1984 at the Kaohsiung Medical College’s School of Nursing in Taiwan and her Master of Science in public health in 1987 at the Institute of Public Health, National Yang-Ming Medical College, Taiwan. She also earned her Master of Science in Nursing in 1996 as well as her doctorate in 1998 at Wayne State University’s College of Nursing. Her main research interest is geriatric pain care using alternative therapies and she has served as principal investigator on several NIH funded grants. Tsai has authored several manuscripts and editorials and has lectured internationally on the subject as well. Tsai is a member of the International Association for the Study of Pain, American Pain Society, Arkansas Nurses Association, Southern Nursing Research Society, Gerontological Society of America and Sigma Theta Tau International Honor Society of Nursing. Rhoads came to UAMS in 1999 as an assistant clinical instructor in the College of Nursing. In 2010, she became an assistant professor in the UAMS College of Medicine’s Department of Obstetrics and Gynecology and is now an associate professor. She also became director of education in the UAMS Center for Distance Health in 2010. Prior to coming to UAMS, Rhoads was a nurse and nurse practitioner at several clinics and hospitals in central Arkansas. Her research has focused on reducing health disparities in rural parts of Arkansas using telemedicine, including the areas of prenatal and postnatal care. She’s presented her work nationally and has authored several peer-reviewed articles. Rhoads earned her Bachelor of Science in Nursing in 1995, her Master of Science in Nursing in 2000 and her doctorate in 2013, all at UAMS. She earned her Doctor of Nursing Practice at the University of Tennessee Health Science Center in 2006 in Memphis. She is a board member of the Association of Women’s Health and Obstetrical and Neonatal Nurses, and a member of Arkansas Nurses Association, Sigma Theta Tau International and Southern Nursing Research Society. Other fellows previously inducted include College of Nursing Dean Patricia A. Cowan, Ph.D., R.N. ; faculty members Claudia Beverly, Ph.D., R.N., director of the Hartford Center of Geriatric Nursing Excellence at UAMS; Jean C. McSweeney, Ph.D., R.N., professor and associate dean for research in the College of Nursing; Ellyn E. Matthews, Ph.D., R.N., associate professor in the College of Nursing; Debra Jeffs, Ph.D., R.N., adjunct assistant professor; and Angela L. Green, Ph.D., R.N., clinical associate professor in the College of Nursing.